My hair has thinned in the top due to neglect, over processing, lack of conditioning, etc. My other hair is dry, brittle, etc. I get it done by a professional. She has braided and added a weave to give my hair a rest from relaxers. Is this a good or bad idea? I don't want to do more harm than good. I plan to get another hairdresser. Please advise, if possible.Thanks. I am concerned about the stress that adding braids and extensions will cause at this time to your already damaged hair. When clients like such as yourself do come to our salon for help and their hair is in extremely bad condition and damaged beyond what I honestly feel I can remedy as a stylist. I generally recommend that they cut their hair down to a short natural style and start over if it is their wish to have a chemical in their hair. If they do not want to cut all of their hair off into a short natural look, then they can slick it back with our Kerasoft Revival Curl Revitalizer and our Kerasoft Quench Moisturizing Spray. Make sure to refrain from using heat. We tend to start relaxing the new growth to 80%, but you can wear a satin lined wig in the meantime. Sometimes we need a break from our hair, and most certainly sometimes our hair needs a break from the ordeals we sometimes put it through. I like them to wear their hair like this for at least 6 months before we reevaluate doing anything to it. The best thing we can do as professional stylists is to sometimes do nothing to exacerbate any problems. I truly do believe that a good stylist is like a doctor of hair and the first rule or the Hippocratic oath in the medical profession is "to first do no harm". This is a rule that not only stylists could benefit from in its simple truth, but all people can use as well, as we go about living our lives. It seems you are ready to find a new stylist, or to order our Show and Tell Wash and Wear Instructional DVD and kit for home use. I am multi-racial (Black, Iranian and Russian) and like many of your clients, have that curly hair that was just so hard to "tame". So, being the "genius" that I am, I had it relaxed straight. I've been doing this for the past few years and lately, my hair is just this huge puff. It's still quite thick but it's dry at the ends and it's breaking (but other than that, it's strong and healthy). My mother advises me not to flat-iron but that seems to be the only way that I can control my hair. Is there any other way to control my hair without having to flat-iron or blow dry it every week? I just feel like I can't do much with my hair if I don't flat-iron it and always end up wearing it in a bun which I'm getting quite tired of. Any suggestions? Please help!!!! We do have many clients who come to our salon that come from a mixed race background. Other clients who have hair of a similar nature that come to Jazma I find come predominantly from Jewish, Italian and Greek backgrounds. There are others, but these are the predominate ones. I generally find the biggest misconception that people have about relaxing their hair is that by relaxing it, it will be smooth and sleek like their friends or family with very low maintenance. This is just not the case. 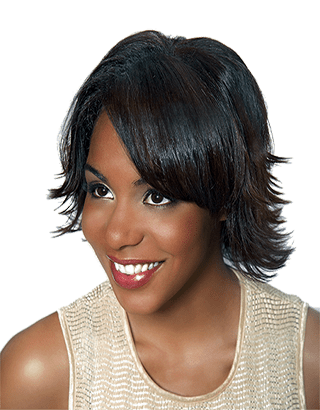 A relaxer is used to decrease and control the hair's natural curl pattern. However, afterwards the hair unless worn in a naturally curly or Wash & Wear Relaxer style has to be wet set, blow dried and thermal curled/ironed or round brushed and blow dried for a smooth straight look, without any puff. This is the truth in your case as you have found to be able to "control" your hair. Is it possible that you could wear your hair in a more natural state? If this is possible, our Wash & Wear Relaxer maintenance products may be an answer for you. The best test to see if our Kerasoft retail products would work for you is this. 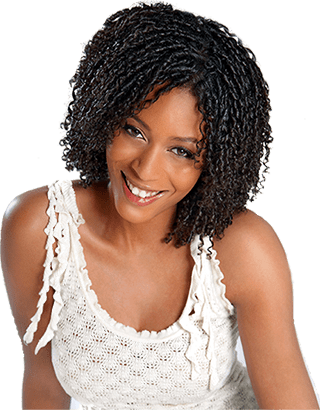 If after you shampoo and condition and while your hair is still damp your hair has waves, spirals, ringlets, curls or a texture you like, they will work for you. The water will moisturize the hair for a while then later it will have all evaporated and you are left with frizzy hair. If this is the case you would need the four products we sell to maintain our Wash & Wear Relaxer look. 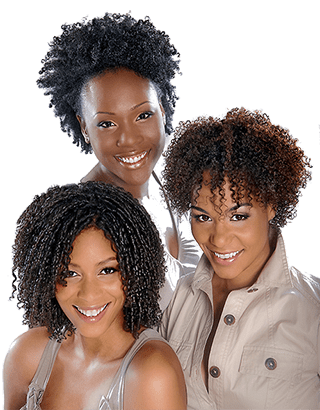 They are Interlink Leave-In-Conditioner, Quench Moisturizing Spray, Revival Curl Revitalizer and Actisilk Curl Enhancer.These products are water based, not greasy and without them our clients who have naturally curly hair or our clients we process with our Wash & Wear Relaxer do not look the same. Some people with fine hair also like to use a little of the Control Mousse to give their hair extra body. If wearing your hair in a more natural state is not an option for you, then unless your hair is in a really fragile, damaged state - which yours seems not to be - I find that blow drying and ironing can only really be damaging if too much heat is concentrated on any area of the hair for too long. I can assure you that I do have clients that do shampoo, blow-dry and curl their hair almost daily. The key is that they don't use high heat on their hair. The reason people use higher heat settings is that they don't know how to test and control the heat and that higher heat gives them a faster style and either they seem prepared to take the chance of damage or just don't know the damage they may be causing to their hair. Here's what I would like to see you do. 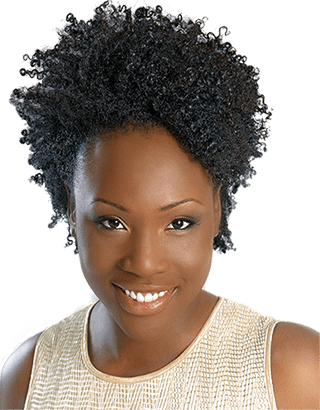 Get to a stylist, you may already have one, who specializes or has experience with your textured hair and have the ends trimmed. This is one sign of too high a heat setting, the ends are the first area to become damaged. I would like you to use only none professional thermal styling tools, such as curling irons and blow-dryers on your hair. Far too many people want to purchase the same tools that we use in the salon and then end up damaging their hair because they give off too much heat and in the hands of someone who can't control the heat and who is not adept with their technique, damage will certainly occur much quicker with professional tools than with non professional tools. When you start to style your hair make sure that your blow dryer and irons are always moving, do not rest or concentrate them for a period of time on one spot as damage may occur. If you need to concentrate the heat of the iron please release then tighten, release then tighten the iron tongs as this will help to avoid damage. I.) Use products that will protect your hair from thermal styling, such as our Interlink Leave-In-Conditioner and our Lelook Thermal Styling Spray. 2.) To test the heat of your curling iron fold a paper towel, white coloured silk material or napkin in half for testing and rest the barrel or your heated iron onto it. It should be able to rest there for 5 -7 seconds without scorching the paper. If the material scorches the heat is too high. White silk or satin material is better to use if you have finer, kinkier hair. 3.) Use small sections when curling they curl faster and require less heat. 4.) When doing your regular routine try adding a little silicone such as Kerasoft Glosify Hair Polish to your hair while it is still wet. I think you will find a big improvement in control of the frizzies and it will add a lot of shine and an improvement in the condition of your hair. 5.) Use the Glas Shine Mist and the Instyle Humidity Hairspray daily. It's my first time having my hair braided, how do I wash It? I have inch wide braids that are unbraided and curled at the ends. In the Caribbean where I come from we have a great deal of women who wear their hair in braids and both men and women who wear their hair in "locs". They are really quite simple to look after in terms of cleansing. My recommendation is for you to purchase a premium quality shampoo and conditioner designed for Black hair. I would also like you to purchase a large tint bottle at your local beauty supply or you could use an empty flip or pull top bottle you may have around, but you will have better results and waste less product with a tint bottle, so it's a good investment. First start by mixing in the tint bottle about one ounce of the shampoo and now fill the rest with water. In the shower start by standing directly under the shower head and using warm not hot water start to rinse your entire head well all over. Use the force of the shower streams to get down into the hair and scalp and also through the braids. After doing this for a while, take the tint bottle with the shampoo/water mix and apply it to your entire scalp. Then starting at the base of your braids right from the scalp apply it to the entire length of all the braids on your whole head. Let this sit for a few minutes and then rinse very well under the shower head, again using the shower streams, and repeat. You do not have to manipulate the shampoo in any way, the act of sitting will emulsify the dirt and oils on your head. Now mix an once of your conditioner as you did with the shampoo, but this time mix one once of conditioner to only three ounces of water and repeat the same procedure, concentrating on applying the conditioner to your real hair, there is no need to condition the entire braid if it is synthetic and not a human hair braid. I can't emphasis enough how important it is to condition your hair even though your are wearing braids in your head. It's also very important that you use quality products as they are in my experience much more concentrated, which is very important when you start to dilute them as I have instructed you to do. Finish by towel blotting, not rubbing the excess water from your head. I recommend you do this at least once a week, more often if you are active in sports, dance or workout. I am interested in trying out a different style when I set my hair. A friend recently told me about straw setting the hair. Could you please explain what it is and how I would go about doing this at home. Straw sets are exactly what the name implies, hair is wet set onto drinking straws. It's a great way of temporarily getting the corkscrew, spirally look that has become so popular. This set is really best done with help of a friend. You need to start by purchasing plastic drinking straws at you local grocery or department store.You will probably find the larger diameter straws easier to work with than the smaller ones. Now shampoo and condition your hair as usual and towel blot. A salon tip we use is to put a very small amount of silicone product such as Kerasoft's Glosify Hair Polish into the hair and comb it through. It really helps to later control frizzys' and puff in the hair as well as adds a great deal of shine. With a tail comb starting at the top of one ear, section out a very small section of your hair and run your comb down its length, the most important part of this set is small sections. Apply a good quality setting lotion or a styling gel that can be used to wet set with to the hair you have sectioned out, carefully following manufactures instructions for product usage and place one end of the straw at the base of this section,angle it downwards and now wrap it around the straw, spiraling it down the end (like the threads on a screw) and secure in place with a clip or bobby pins (for the shorter hair sections you may use scissors to trim the straw to a correct length to clip or pin easier). You also have the option of twisting the hair before you spiral it on to the straws, this will give a more springy, coily than ribbony look to the finished style. Continue this down toward the nape of the neck following the perimeter of the hair line repeating the sectioning and wrapping. When you reach the top of the other ear reverse and work your way back the other direction, until the whole back of your head is done. Measured by a line from the top of one ear across the head to the other, this is the back half. Now start the same procedure to the front. Again working from the top of one ear around the perimeter of the front over to the other ear and then reverse back, until the front half is done. This set will take some time and It is important that you keep the hair that is not yet set damp by spraying it with water from time to time until you are ready apply the lotion or gel and spiral down. You can now air dry the set, letting it just dry naturally (this will take the better part of a day, less if it is hot and dry out), use a hood dryer if you have one or use a diffuser on a blow-dryer to slowly dry your hair, do not use a blow dryer without a diffuser on your hair as this will lead to a poor result. After your hair is dry carefully remove all of the straws and apply a little of the silicone based product as mentioned prior to your hair by putting a little in your palms and scrunching it into your hair. Do not comb or over manipulate your hair as this will lead to separation of the spirals and take away from the look you just went through a great deal of time and effort to achieve.